We've included listings for companies such as Plumen and Lamps Plus inside our Fluorescent Lighting guide. Award winning British company sells what it calls the world's first designer compact fluorescent light bulb, the Plumen 001. 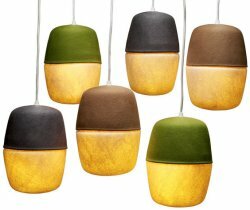 Felt gives a soft glow to these hanging lights.